Aesthetic surgical breast enhancement tailored to your personal needs and according proven surgical techniques. Aesthetic surgical procedures where the facial skin is lifted and the excess skin is taken away. Removal of fat cells through liposuction and liposculpture, supplemented with a tummy tuck to remove excess skin if needed. Discover the beauty institute of the Atlas Kliniek: top quality beauty treatments in a professional environment. You can come to the Atlas Kliniek for a complete package of face and body treatments and corrections. We offer a unique all under one roof concept: diet advice, spa treatments for body and face (and soul), medical pedicures, dentistry, hair transplants, non-surgical anti-wrinkle treatments, plastic and cosmetic surgery, vascular surgery. 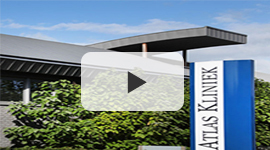 The Atlas Kliniek is the place to be for all kinds of cosmetic surgery. But it is also an overall body care and beauty care concept. From an enjoyable facial treatment to breast and nose corrections. But we also offer so much more. With us you’re in excellent hands.